August is always an insanely busy month for us, and this year is no exception, so I’ll keep this post short, but sweet. Here is one of the first photos that resonated with me as I started editing through the photos from Ernest and Cora’s wedding last weekend. It’s a fleeting and beautiful moment that we captured during their wedding ceremony on the lawn at Brock House overlooking the sea. Today is Maria + Edgar’s 1st wedding anniversary, so we thought we’d share some of their wedding album with you, since we didn’t post a blog story of their day. 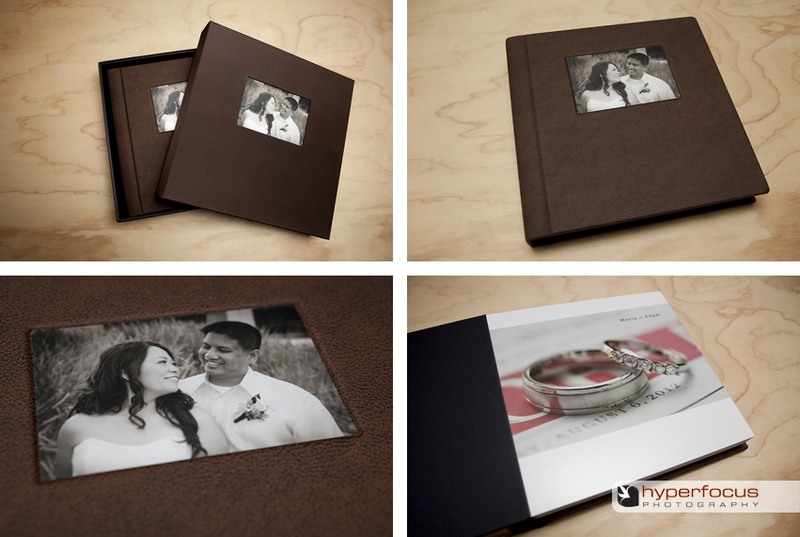 Their Richmond wedding album has a custom handmade box with an inset photo that matches the cover of their album. Their album cover has a lovely soft distressed brown leatherette which feels great in your hands. So luxurious! They had a beautiful Richmond wedding day and their beautiful wedding album reflects it! Their wedding ceremony was held down on the dock at the UBC Boathouse and although it was a luncheon wedding, they surprised us with heaps of dancing right in the middle of the afternoon! We were so surprised to see a full-on dance party in broad daylight, but it sure made for a very festive party….and some excellent Pilipino line dancing, breakdancing and YMCA dance moves! “Thanks again for everything Steff + Justin…we have been thoroughly enjoying our wedding album. It’s now prominently displayed on our new coffee table! Edgar actually surprised me with a replica of our wedding cake for our anniversary. I had told him how disappointed I was that I didn’t even get a chance to taste the cake on my wedding day. From what others were also telling me, it was delicious. So for the past year this is what I have been telling our friends and family that this was the only regret I had about that day….not being able to taste that cake! So what does my wonderful hubby do??? He went to the same bakery and ordered the same cake, modified of course…planned a small gathering of friends and had a surprise “cake party” at our place, this past Monday. It was awesome! Here is a little sneak peak from Whitney + Brian’s wedding day. They were super lucky and were married twice in one day! 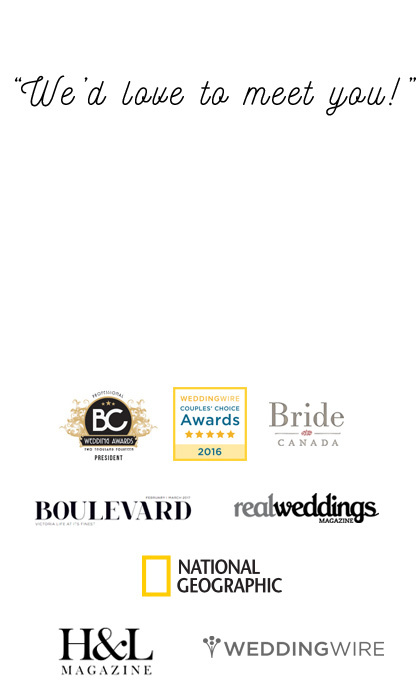 We love that being Vancouver wedding photographers gives us the chance to photograph such beautiful multicultural weddings, and especially for such a lovely couple as these two! First they had their Sikh wedding ceremony in the morning and here is Brian getting ready in Burnaby with this sister and Dad (and Justin photographing), while I was in PocCo photographing Whitney’s final touches being put on with her friends helping hands at about the same time. It’s kind of neat to see what was going on for them simlutaneously. And in the afternoon they switched it all up and had a Western wedding ceremony at the UBC Boathouse in Richmond. Their day was soooo amazing, filled of so much emotion, love and tears of joy! We look forward to showing you more once they are back from their honeymoon in Thailand. A few weeks ago, we packed up the car and headed up to the Sun Peaks Resort near Kamloops. Mike and Jess had invited all their friends and family up there for their wedding on the opening weekend of the resort. They chose Sun Peaks for so many reasons, but mostly because they both spent time so much time up there growing up and their families had such fond memories, so it seemed like the perfect choice. And what a gorgeous, hot sunny weekend they had! Here are a few select photos from their day. This beautiful Ferrari is as much a member of Mike’s family as he is. His father has been lovingly maintaining this rare 1972 Ferrari Dino 246 GT all of Mike’s life. So, of course they had to go for a little spin on their wedding day! It did sound beautiful as they zoomed by!! Brooke and Jared’s vintage chic wedding was filled to the brim with so many lovely handmade DIY wedding touches everywhere you looked! What they created was truly like no other wedding we had ever seen before! Brooke and Jared put their heart and soul into all the details. The list of wedding DIY they created was endless, but to name a few, they hammered spoons used as bookmarks in their cookbook wedding favours, they made a white picket fence shelf used as a tribute to their grandparents, made a birds nest ring pillow, a tequila tasting bar, a quirky wedding photo booth, many lace and twine wrapped mason jars centrepieces and sooo much more! It was rustic beauty done to perfection in an understated elegance. Their Oliver vineyard wedding was held at the beautiful and lush Stonehouse Vineyard in the heart of Okanagan wine country.